and also Swiss made implants IHDEDENTAL with very high quality but with very reasonable price. If your dentures don't stay stabile and you have fear of surgical procedure, we have solution for you. IMTEC MDI SENDAX mini implants. Without gum incision (practically without surgery) you have your old or new denture locked to jaw right after intervention. BICON short implants expand implant implantation and reduce the need for bone enhancement procedures. The Bicon system is a unique dental implant system that offers a dental community worldwide a comprehensive solution since 1985. 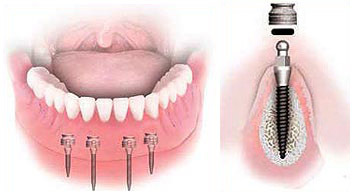 Bicon's unique plateau design follows the solid principles of bioengineering that allow the use of short implants. Its unique anti-bacterial attachment system, conical locking of implants and abatments, allows the positioning of a 360-degree universal abatment - which offers restorative flexibility that does not have any implant system. The sloping edge of the Bicon implant door absolutely provides the aesthetic of the gingiva around the crown on the implant. These superior results are easily achieved because the bone around the neck of the implant is present and enables bone support for interdental papillae.